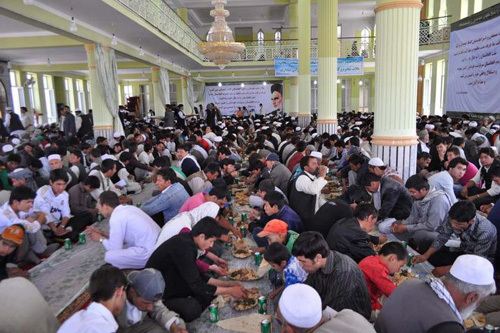 Ayatollah Khomeini's death anniversary on June 3rd has sparked a fierce debate among the Hazara intellectuals all over the world. Social media sites such as Facebook has seen a flurry of activity among Hazaras after the posting of images for and against the anniversary commemorations in Kabul, Afghanistan. 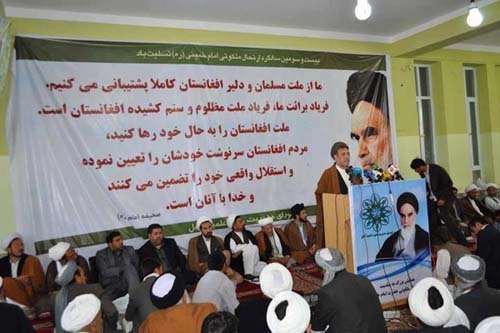 "This is Kabul, not Tehran or Qum"
"To you living on the crums (of Iran): Enough dishonesty!" 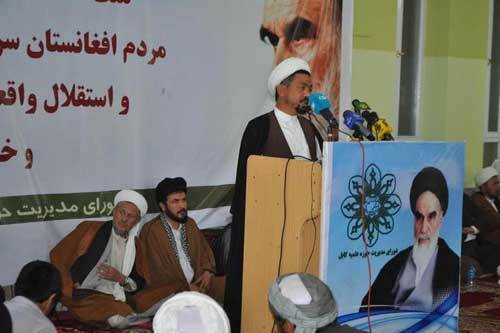 Hazara leader and member of Afghanistan's Parliament, Haji Mohammad Mohaqiq (In Iran, he will be affectionately titled as "Haji Mohammad Mohaqiq Berberi") speaking to a crowd in commemoration of Ayatollah Khoemini. An unknown sheikh speaking to the crowd commemorating the anniversary. Customery dinner following the anniversary commemoration. this "Nan-e Tandoori" in Pakistan. The Iranians call this "Nan-e Barbari"
or the "Iranian Barbari Bread"
With Hazaras, due to their Mongol identity, the use of racial slur such as “Barbari” (i.e. Barbaric) as their ethnic identification leaves no doubt about the extreme prejudice towards Hazaras for years [Owtadolajam, 145; Poladi, 259]. For all these years, the Hazaras in Iran were known as Barbari, which they resented very much. 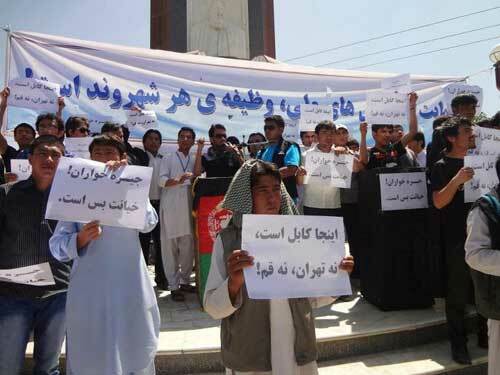 They wanted to be called by the name Hazaras or another appropriate term. Finally, they appealed to the Raza Shah, the Great, who granted them the name of Khawari through a Firman (decree), and since then, the name Barbari has been abandoned [Poladi, 259]. Hazaras - the most persecuted ethnicity for the past 300 years - are only now catering to education in large numbers and beginning to learn of their history for the first time. Most Hazaras are unaware of the deragtory titles used for them by Iran. Their sympathies with Iran lies in part due to the Shia holy sites, Iranian propaganda machine and Iran's proxies amongst the Hazaras. Most Hazara intellectuals in Afghanistan and around the world are increasingly becoming critical of leaders such as Mohaqiq and Khalili. There are over 50 Hazara members in Afghanistan's parliament, and with exception of few, most are never seen or heard speaking on the main Hazara issues such as "annual attack by Kuchi (Pusthun nomads)" on Hazaras lands which results in looting, plundering, and killings of Hazaras every year in Afghanistan; the Hazara genocide in Pakistan; and the discrimination and derogatory titles bestowed on Hazaras in Iran. Leaders such as Mohaqiq are the main reason for Hazaras being titled as "Pro Iran" by the hypocritical world media and the hypocrites in Afghanistan and Pakistan region. In the past, representative of President Karzai was caught red handed with brief case full of dollars coming from Iran, and Iran has provided shelter to both Hikmatyar (Pushtun) and Ismail Khan (Tajik). The word "Ayatollah" is considered a PhD in the Shia Theology. There are hundreds of Ayatollahs that graduate from the seminaries in Najaf, Iraq and Qom, Iran. 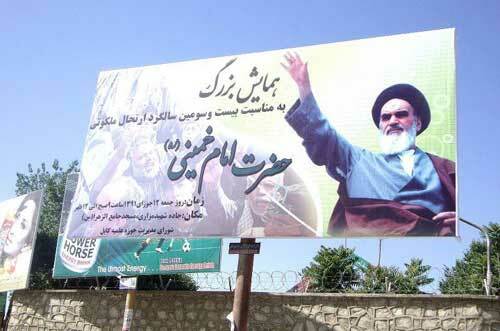 The title for the most senior cleric in the Shia Islam is "Ayatollah ul-Uzma" (or Grand Ayatollah. Example, Ayatollah Sistani of Iraq). Every practicing Shia must have taqleed (following) from a living Ayatollah or Grand Ayatollah. Ayatollah Khoemini had huge followings among Shia muslims at the time when he was alive. Currently, most Shias follow Ayatollah Sistani of Iraq. Unlike Sunni sect of Islam, where it is not clear on who can issue a religious decree (example, you can see many Jihadi leaders using the term "Fatwa" of Jihad against USA), in Shia Islam, only fatwas from a living Ayatollah are considered as valid and to be adopted by his followers (example, Khomeini's fatwa against Salman Rushdie for writing the book "Satanic Verses" resulted in Rushdie going in hiding for years for fear of his life). Although there are many subsects in Shia Islam (such as Ismailis, Alawaites, etc. ), most Shias are followers of 12-Imams. The first being Ali Abn-Abi Talib (AS) (son-in-law of Prophet Mohammad - PBUH), and the last being Imam Mehdi (AS) (the messiah that is in occultation and will come before the end of world). Over 90% of all revered Shia religious sites are in Iraq. Until recently, Iraq was ruled by the Sunni minority (such as Saddam Hussein), and did not allow Shias for pilgrimmage to Iraq. With a Shia majority now in power, Shias from all over the world for the first time are allowed to visit for pilgrimmage in large numbers (for example, this past year Ashura commemorations in the city of Karbala had seen the largest gathering of humanity anywhere on Earth). In coming years, Iraq will emerge as an equal to Iran (if not bigger) among the Shia muslims. It should be noted, however, that Iran may still wield significant influence among those Shias whose languages closely resemble Persian (example, Hazaragi and Dari) as compared to Arabic (as spoken in Iraq). Common borders with Iran is another factor due to which Iran may retain significant influence on Shias in Afghanistan and Pakistan. In the past, Iran was the only country with a Shia majority and where the Shias were in power. Iran has a lot of Shia religious sites as well. The significant religious sites in Iran are of the 8th-Shia imam Ali Raza (AS) in city of Mashad, Shah Abdul Azeem (AS) in Tehran, and Bibi Masooma (AS) in Qom. (Iraq and Bahrain are the other two countries with Shia majority; Lebanon has 1/3 Shia and Alawites - a subsect of Shia - are the ruling minority in Syria). Syria is another country with important Shia religious sites. Prominent among the revered sites is the Shrine of Bibi Zainab (AS), the sister of Imam Hussein (AS) - the third Shia Holy Imam and the son of First Shia Imam, Ali (AS). Ashura is the most significant day for practicing Shias in any given year commemorating the death anniversary of Imam Hussein (AS) with his entire family and companions on the 10th day of Moharram - the first month in the Islamic calendar. For example, this past year Ashoora commemorations in Karbala had seen the largest gathering of humanity anywhere on Earth. The words "PBUH" (Peace Be Upon Him) is used for Prophet Mohammad only. Shias use the abbreviation "AS" for Aleh-Salam (another word that translates to "peace be upon him") for all Prophets (124,000 including Prophet Mohammad) their 12-Holy Imams and the families of the Imams. Sunnis use "Razi Allah Unho" (translates to: May Allah be Happy with you) for Holy Imams and companions of Prophet Mohammad.